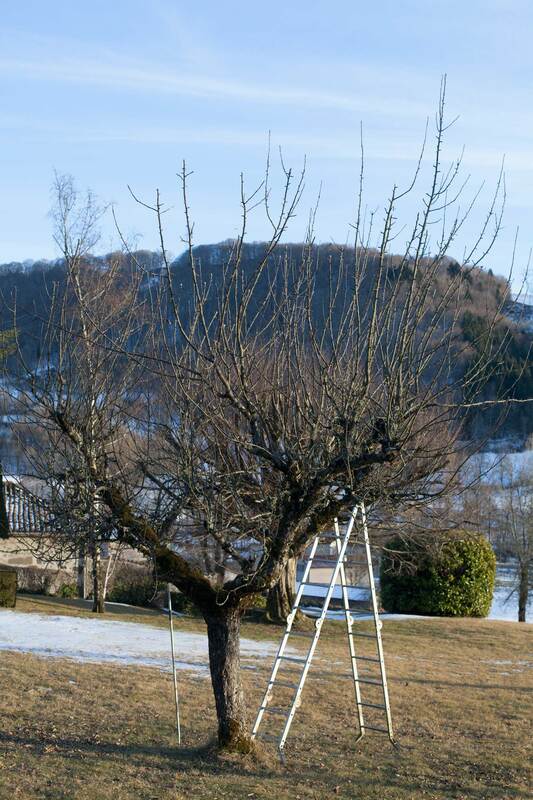 The ‘Croqueurs de Pommes du Cantal’1 is a charity that lists and protects local fruit cultivars; its members exchange scions to graft new trees. I put myself to the test: would I be able to participate and provide scions from our trees? Pomology, the science of fruit-growing, is not an easy discipline to master. In particular, the diversity of varieties makes their classification approximate and on top of that, cultivar names change from region to region. 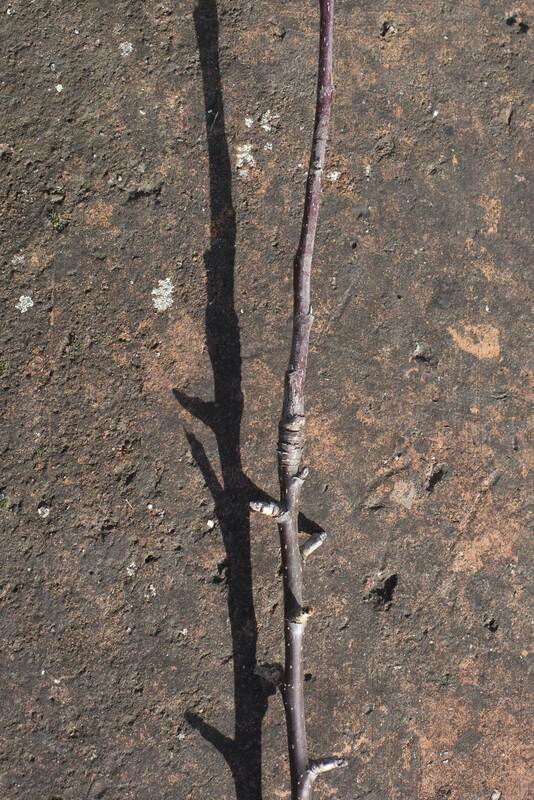 Therefore, unless you have a record of what was planted in your garden, it is not easy to identify your trees and name the scions you are collecting for grafting, especially when it comes to ancient varieties that sometimes differ very little from one another. As for actually cutting the scions, working with high branches is a challenge for someone doing it for the first time. So, overall, how did I manage? I cut scions a the top of this not-too-high first apple tree in our Saint Simon garden (scion: ‘a young shoot or twig of a plant, especially one cut for grafting or rooting’, source Oxford Dictionaries). The tree is healthy, so the scions could be donated for use in other gardens. Photo 21 January, France. 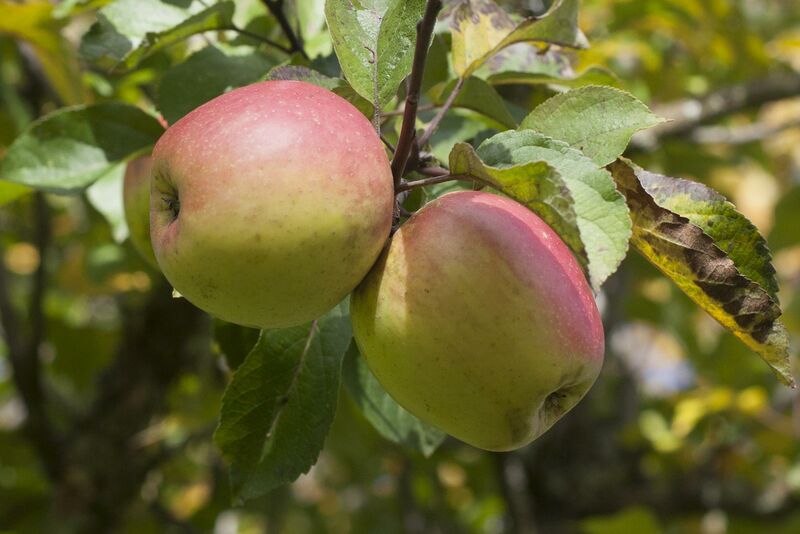 The scions were tied and labelled with the name of the cultivar, ‘Sainte Germaine’, which I had identified in 2015 by looking at the fruit, tasting it and comparing with apples of the same name I found on the local market. I was confident I was right. I donated the scions yesterday. 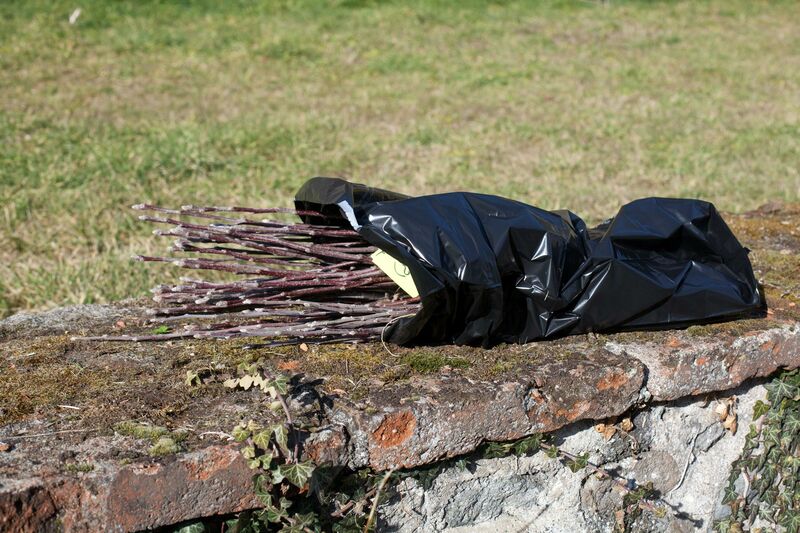 They will be kept for two months in a cool place by the ‘Croqueurs de Pommes’, before being offered to the community of its members for exchange. The apples in autumn 2015. I still carried out further research today, which showed that in our region, two slightly different apples varieties, one bigger and rounder than the other, have the same ‘Sainte Germaine’ name. So I sent a picture of the apples, which belong to the smaller variety, in addition to giving the scions. It was the only one picture I had, which does not allow to see the crown and the stalk, nor what remains of the flower at the bottom of the fruit. Still Ok I think. Photo 11 October 2015. 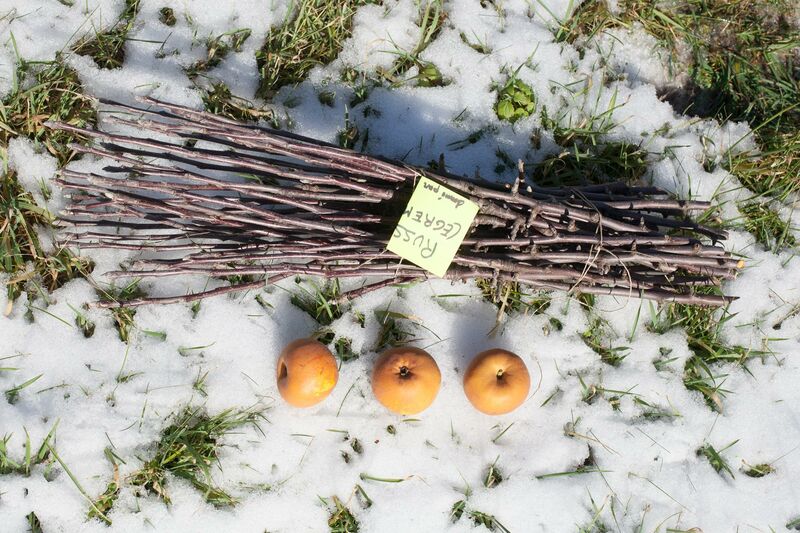 I also donated scions from another tree, of a cultivar which is part of the russet family. As I couldn’t identify the actual cultivar name, and still had some fruit, I gave three apples to help the ‘Croqueurs de Pommes’ to find out. If they do, they will add the scions to the other cultivars for the exchange day. Otherwise, they will not include them and most of them will be lost: I would have failed to participate fully in the sharing. I also made a slight mistake when collecting the scions: I knew that the useful part is the shoot of the year (top). I could have left the bottom part on the tree, as the large buds are fruit buds: we will have less fruit this year than the tree was ready to produce. It was partly due to the height of the second tree. 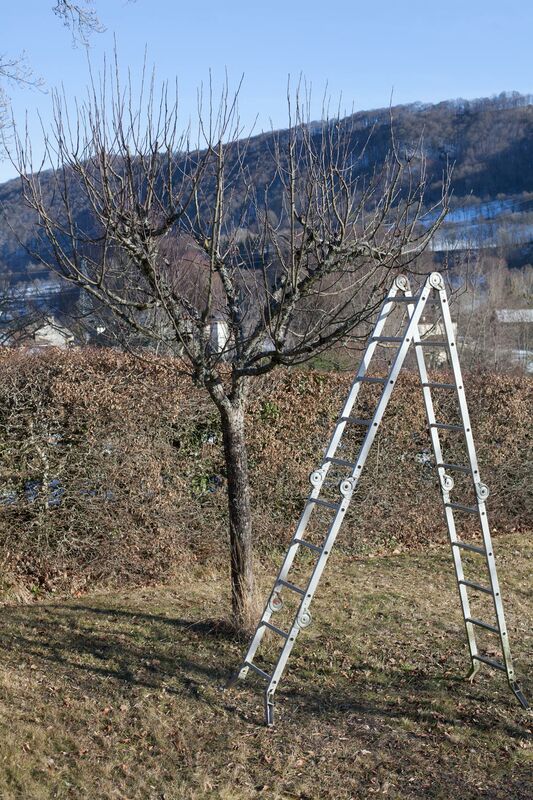 Cutting high branches from it, on the ladder or standing in the tree was not that easy even with the right tool, a light long-handled pruning shear that can be used with just one hand. Overall, I gave around sixty scions. Next year I will be more effective. I am still more of a jam maker than a fruit grower. 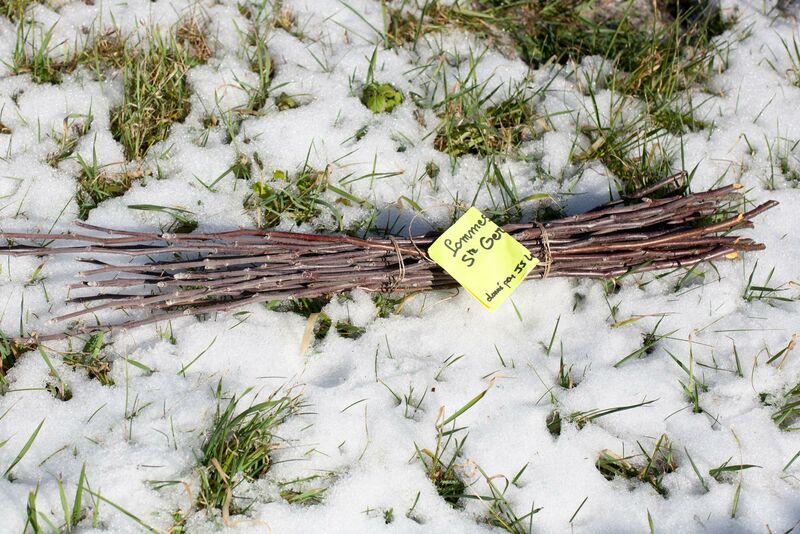 This entry was posted in Grow and tagged Apples, CroqueursDePommes, France, Saint-Simon by Les Jardins d'ici. Bookmark the permalink.